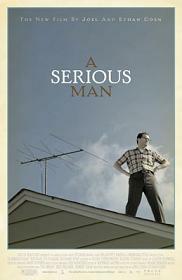 The Coen Brothers return with a mystifying yet spiritually enriching fable in A Serious Man. The antithesis of their star studded political satire Burn After Reading, Coen’s Joel and Ethan have cast their latest with hardly any recognisable actors, yet have not strayed from their familiar tone and wit which can only be described as Coen-esque. Set during 1967, the film centres on family man Larry Gopnik (Michael Stuhlbarg), a mathematics professor and respected member of the Midwestern Jewish community in which he resides. As if by divine will, a cascade of troubles shatters Larry’s once content life: his wife (Sari Lennick) leaves him for another member of the community (Fred Melamed); his son (Aaron Wolf), who is to be Bar Mitzvahed, is preoccupied with scoring pot; a Korean student (David King) has attempted to bribe him for a passing grade; and his troubled brother (Richard Kind) has fallen afoul with the law. With such dire straits, Larry begins to question the validity of his life and also ponder if God is testing him. For this reason, a much suitable title should have been “A Desperate Soul”, as Larry seeks religious guidance from three rabbi’s who all offer different yet (in hindsight) wise advice: the first preaching perspective; the second acceptance; and the third meditation. Presented as if the Coen’s adopted a modern version of the Book of Job (the biblical story which encourages the need to question the role of the divine), A Serious Man is in itself a touching parable infused with a twisted spirituality, as displayed in a drug induced POV of a religious ceremony which is both touching and psychedelic. A personal touch is felt throughout. The Coen’s were also raised in a Midwestern Jewish community, and as a result they bring an authenticity to the look and texture of these characters and the environment they inhabit. Yet it is their unique approach to the way in which they tell their stories that resonates the most. Opening the film with a presumedely unrelatable, Yiddish spoken, supernatural folk tale, should be the kind of curve ball expected from these men, yet they always manage to have the element of surprise on their side no matter how prepared one can be. And it is these kinds of surprises which makes A Serious Man a film to visit on multiple occasions, not to “accept the mystery” as one character so eloquently puts it, but to embrace the complexities and trails in this man’s life (and how wonderfully he is played by theatre actor Michael Stuhlbarg) which all us must face in our lives.